Gotei 13 - 110 Years पूर्व. . HD Wallpaper and background images in the ब्लीच ऐनीमे club tagged: bleach. Hmm...is it just me, or is a squad missing here? It's interesting to see the concepts for these guys, especailly the big guy between Shunsui and Ukitake, but kinda sad that we'll probably never get any real information about them. Is the big guy next to ukitake the squad 11 captain zaraki killed or the squad 10 captain that was replaced by hitsugaya. Actually, Unohana, Ginrei Kuchiki was Byakuya's grandfather lol. I'm pretty sure the dude underneath Yoruichi is a relation to Omaeda - he has that silly, gold chain around his neck and that arrogant look on his face. Either Squad Eleven or Ten Captain is missing here, as far as I can see. I know that Squad One, is the Head Captain, plus Ginrei, Shunsui, Jushiro and Unohana are accounted for, plus then Shinji, Kensei, Rose and Love. The only one's after that are Kisuke, Yoruichi and the big dude, who I think was the Squad Eleven Captain. I gather it is Squad Ten Captain that is missing here. I'm 99.9% positive that during the TBTP arc, during the captains meeting Kyoraku mentioned something about the tenth squad captain recently falling in battle.. or maybe I'm just mixing things up, but either way I'm pretty sure that's the eleventh squad captain since I know for a fact there was one back then. The captains were complaining about how he never showed up for meetings. The guy under Love looks like he's related to Iba.. maybe his dad or his brother? The girl above Rose was Iba's mother. 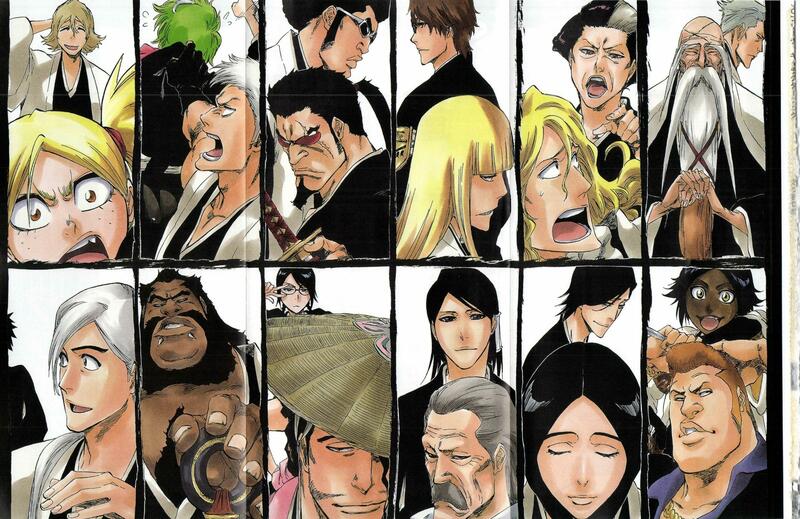 The sixth squad was lead by Byakuya's grandfather with his father as vice-captain. The fourth squad vice-captain was either Hanataro's brother or father... but I'm pretty sure it's his brother. And the guy under Yoruichi is Omaeda's dad. The one missing is Squad 10 which it said to be Isshin Kurosaki, but it has not been confirmed by Tite Kubo officially.